One evening as I was listening to my 6 year old pray, I heard her say “and I love myself.” She said this after she had told God she loved him and that she loved her mom, her dad, her sister and her dog. Another day of prayer, she said the same thing. “I love myself.” I was in awe at hearing her say these words. As an adult, I struggle so much with this concept, thought, feeling…. To love myself, what does that entail? How do I love myself with all my faults, with all the things I’ve been told by others, all the times I didn’t measure up to others’ expectations, especially to those who I loved the most. Then I recalled a book “Walking With Purpose”. To love myself, I must first know and feel the love of my Heavenly Father. I cannot love myself if I don’t know the love God gives me each and everyday. One of my favorite verses from the Bible is in Isaiah 43. He says that “I have called you by name, you are mine when you pass through waters, I will be with you; through rivers you shall not be swept away. When you walk through fire, you shall not be burned nor will flames consume you for I the Lord am your God, the Holy One of Israel, your savior. 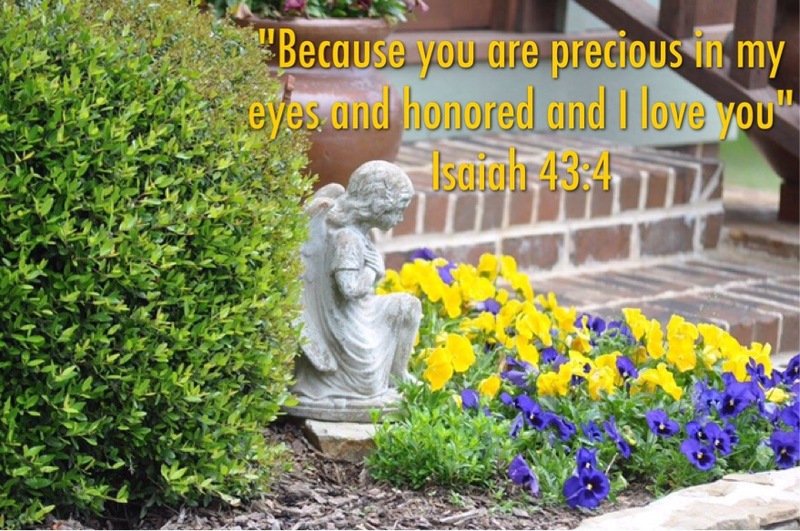 Because you are precious in my eyes and honored and I LOVE YOU.” God loves me for everything I am. He knows my faults, yet He still loves me – I am His. He knows my capabilities because He has called me by name. He would go to the ends of the earth through the river, through the fire for me, for my life, my soul because I am precious in His eyes – He loves me. It’s simple for a child to understand because they understand this unconditional love much more deeper than adults do. So today I will tell myself I love myself because I am His creation, His child. He has “formed [me] in my mothers womb” and I am all He has created me to be with all my faults, limitations, and talents.